Stock control labels can be utilised to ensure goods are used safely within your premises. By labelling items clearly with pertinent information such as days of the week or maintenance details you can let all staff know at a glance what stock should be worked with and when. We carry a range inventory control labels which cover several categories, including hazard, quality control and safety information. Our stock control label selection will prove to be invaluable everywhere from warehouses to kitchens. 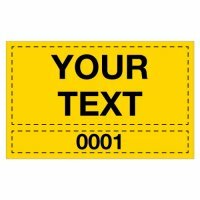 If you'd like to find out more about the types of inventory control labels available and how to choose a material to ensure information is always readable, check out our stock labels guide. Stock control is an important part of health and safety in the workplace. By labelling goods clearly with names and expiry dates, stock can be monitored to minimise waste and prevent damage to machinery or injury to customers. Our stock control labels can assist you in ensuring you follow and comply with all current regulations regarding the turnover and use of goods. Although the obvious application for employing stock control labels is in food preparation, our labels can be used in the workplace in numerous ways. For example, they can display information regarding inspection dates or provide a servicing or calibration record for equipment. Our labels also enable stock to be labelled and monitored so that it is used safely and stored in an appropriate manner. Our stock control labels can assist in the stock control of various types of products and equipment. We offer a broad selection of labels for items that need to be monitored, including self-laminating, write-on stock control label for recording equipment numbers. These ensure action is taken at the appropriate time to stay in accordance with health and safety regulations. We also stock a selection of stock control accessories that work in conjunction with labels, such as inspection label clippers, and economy write-on seals. Many of our stock control labels feature specific colours to denote days of the week or months of the year. This will allow quick visual checks to be made of stock being held and make assessing stock levels easier. By using this information, you can see “at a glance” whether supplies are running low or, conversely, if you are holding too much stock at any given time and plan accordingly. It is well worth carrying this colour coding into other parts of your operations as it can have a marked impact on workplace efficiency. We offer stock control labels in a range of materials, including vinyl, vinyl cloth, aluminium, polyester, paper, polypropylene and brass. Because of this our labels can be used to mark all types of stock, in a variety of environments. Our tamper-proof and self-laminating stock labels are also protected to ensure the data recorded can’t be changed or manipulated. We also carry stock control labels that are treated to be water, chemical and solvent-resistant to ensure data can’t be accidentally removed. If you require stock control labels that show non-standard information meet your workplace’s specific requirements, we also provide the facility to design your own stock control label on our website.